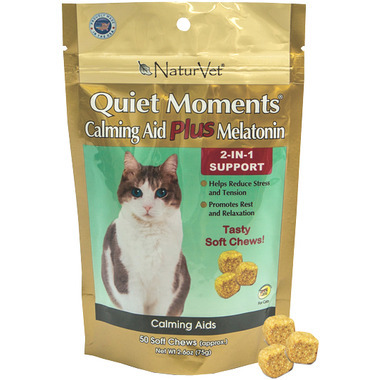 Naturvet Quiet Moments Calming Aid Plus Melatonin Soft Chews are a natural solution to calming your pet. This unique blend of Thiamine and L-Tryptophan will help reduce stress and tension, while ginger supports sensitive stomachs. Allow the melatonin to help promote rest and relaxation and reduce the stress in both you and your feline friend! Active Ingredients (Per 2 Soft Chews): L-Tryptophan (50 mg), Chamomile (6 mg), Thiamine (6 mg), Ginger (1 mg), and Melatonin (0.01 mg). Inactive Ingredients: Brewer's Yeast, Cod Liver Oil, Flaxseed Meal, Glycerin, Lecithin, Natural Flavoring, Oat Groats, Rice Flour, Sorbic Acid, Vegetable Oil and Wheat Germ. My cat wouldn't eat these. Very good for calming down nervous cats. Been using it during a heatwave to help cats cope. Works well for nervous, over-stimulated cats. This product works to calm my nervous cat and makes him (and me) feel more content. These are great for calming down my elderly and timid cat during thunderstorms and fireworks. I had to take my cat to the vet so i gave my cat this before I left the house and I never heard a peep out of her all way to the vet, and it was about hours drive...she was so relaxed and calm. I recommend these highly. They worked. These treats are great! My cat gets super sketchy sometimes, anxious and hyper and one of these treats seems to take the edge off. They're a little large, and he seems to have a hard time eating them, but he likes the taste and they work! 1 treat makes him nap most of the day! We use these for our cat who is scared of fireworks, thunderstorms, etc. I give him one only and it really calms him down through a stressful time. Bought this product to help with my cat's anxiety, it helps a lot to calm him down, he eats them right away no problem. Smells pretty terrible but unlike the others, my cat eats these without any problem, and they seem to work really well. I took him on a long trip (car, plane) and gave him a couple of these and he was totally calm. My cat wouldn't eat it. The chews are big and gritty. But when I mix it with soft food he'll eat it no problem and it does work really well. My cat is super anxious and with this he is more calm, less jumpy, really works great. Cat wouldn't touch this stuff. Waste of money. My two cats got excited when they smelled it the first time but one cat couldn't finish her first one and now runs away when I show her a treat. The other ate it but now winces and backs away when I offer her one. Needless to say these soft chews will be staying in the bag. this is a grat product, my cat loves them and they realy help his anxiety!...i use with the spray from the same company and together they heald my cats wounds from his scratching!